Anaglyph is a word that has its root into the greek language. (what it makes to draw a character). main page with more images (www.mcs.csuhayward.edu/~malek). Images or drawings in 3 dimension is pretty old, on a human point of view. It seems Euclid already experimented with it. Some images from the 13 century, are among the oldest drawings we currrently are aware of. Later at the Renaissance, Leonard de Vinci then Jacopo Chimenti made several drawing using 3 dimensional techniques. Sir Charles Wheatstone in 1838 made the first stereoscope, it was a mirror stereoscope. He patented it in 1838. 1839, a year later, Charles Wheatstone find out about another invention, photography. Daguerre (in Paris) and Fox Talbot (in London) are starting to create photography process. Sir Charles Wheatstone did not wait and asked to have a few pictures taken using his stereoscope. Around or after 1846 Oliver Wendell Holmes (en.wikipedia.org) developa a popular model of stereoscope. Around the same time, David Brewster invent a two lenses stereoscope, it is more convenient to use than a mirror stereoscope. Also photography techniques are still at the beginning, images lack contrast. He ask somebody to make a two lenses camera, it will be the first 3 dimensional camera. In 1850 for the "Exposition Universelle", he show is camera to the queen Victoria. She is so enthusiast about it, she order one from the optician Jules Duboscq. this has been the beginning of a long trend. 1853 the first commercial 3 dimensional cameras from "Mackenstein", "Voigtländer" and others show up. 1853 Sir Claudet write the first book about 3 dimensional photography. The description of an anaglyph seems to date to 1853 by a person called "Rollman". Original image by "P.Gidon" (www.alpes-stereo.com). main page with more images (www.alpes-stereo.com). Charles d’Almeida present the new technique at the "Académie des Sciences de Paris" (French Scientific Academy). 1856 Another book about 3 dimensional photography, is written, by Brewster. This book is well known as it has been republished in 1970. 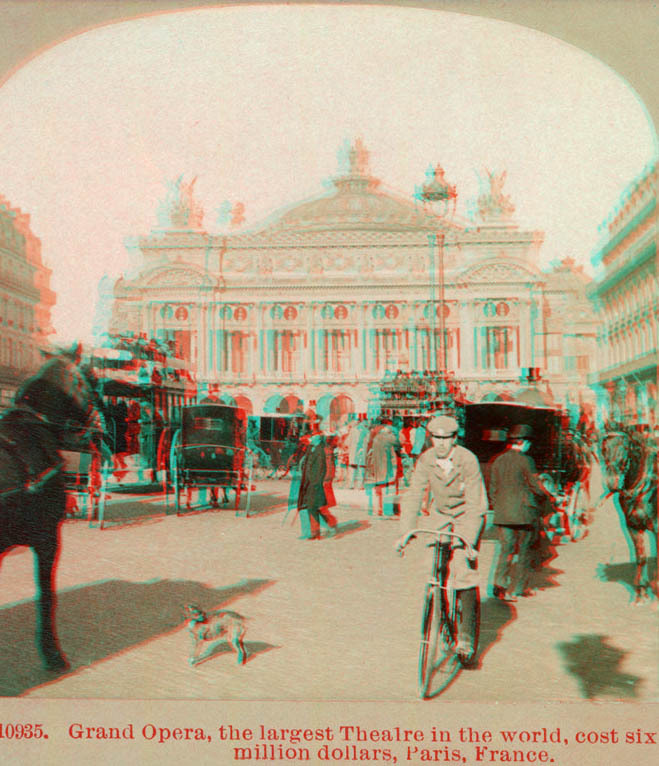 1858 first projection using anaglyph technique happen in Paris, by D'Almeida. 1860 first scientific application using stereoscopy technique. main page with more images (www.stereo-club.fr). Louis Ducos Du Hauron improve the technique, in 1891 give the name "anaglyphe" (no typo error, it is in French) to this technique. 1893 first 3 dimensional camera "Vérascope" made by Jules Richard, it is a camera, allowing film changes in full daylight, it was not the case before. 1893 Stereoscopic Society funded in London. 1893 beginning of the 6x13 format. It seems it still has some applications today. In 1903 the "Stéréo-Club Français (www.stereo-club.fr)" or "French User Group of Stereoscopic Imaging" has been created. It is a versatile group working with many stereoscopic imaging techniques. In 1904 the same group start publishing a monthly magazine called "Images en relief". This magazine is still in print today. 1908, Gabriel Lippmann suggest to replace the screen mask of Sir Berthier (1898) by cylindrical lenses. 1915, first projection in 3 dimensional using a process called "éclipses"
Up to 1920 the cylindrical lenses of sir Lippmann, are still improved. 1936 Louis Lumière adapted still anaglyph images for the cinema. Original image by "P. Gidon" (perso.orange.fr/alpes-stereo). This anaglyph image is from a movie pictures. It has been creeated from two single frame. 1949 first mass media produced 3 dimensional camera. It is produced by the hundreed thousand, it is called the "Realist" its creator was Seton Rochwite. in the 1950's, Maurice Bonnet, still improve the proccess of the cylindrical lenses, at a point, scientific images and video are using this proccess for research. 1975 May 8th - May 13th. International Stereoscopic Union, was founded at the First ISU World Congress (www.stereoscopy.com), held in Wageningen (The Netherlands). In 2002 the red and green started to phase out by the better combination Red and Cyan, which is a combination of Blue and Green color. This new combination allow a wider color range to be seen, among them skin tone seems to show up closer to reality. In 2003 For its 100 years, the Stéréo-Club Français organize the international stereoscopy congress, a book with the title "Images en relief d’aujourd’hui (www.stereo-club.fr)" or "Today's photos in 3D" is printed to commemorate its 100 years.